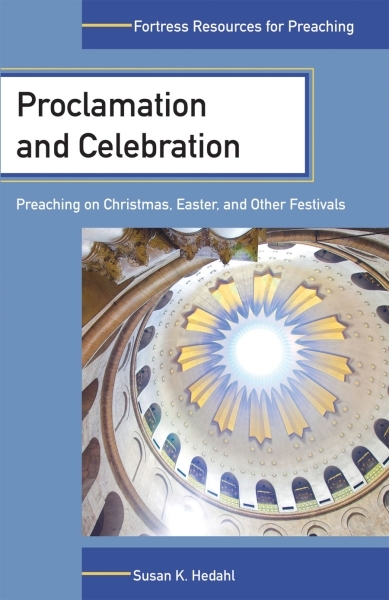 PROCLAMATION AND CELEBRATION: Preaching on Christmas, Easter, and Other Festivals (Fortress Resources for Preaching). By Susan K. Hedahl. Minneapolis: Fortress Press, 2012. Viii + 168 pages. People who follow the ecclesiastical year or the lectionary will have come across several festivals that mark the great doctrinal emphases of the church -- Christmas, Epiphany, Easter, Ascension, Pentecost, and Trinity Sunday. Each festival marks an episode in the establishment of the reign of God, beginning with the birth of Christ and moving through Resurrection, the coming of the Spirit, and finally a proclamation that the God we meet in Jesus comes to us as Trinity. Some of these feasts fall on Sundays, but others don’t. In the case of those days such as Epiphany and Ascension, their feast may be celebrated on a Sunday nearest to the date. Why are these days important and how might the preacher address them in a meaningful way? These are the questions addressed by Susan Hedahl, the Herman G. Stuempfle Chair of the Proclamation of the Word (Preaching) at Lutheran Theological Seminary at Gettysburg, in her book Proclamation and Celebration, a volume published as part of the Fortress Resources for Preaching series. Hedahl sees these festivals as important opportunities to address key faith claims of the church, especially in the face of growing secularism. These festivals, she believes, serve multiple purposes, for they are “expressions of the biography of God’s work among human beings” (p. 5). Hedahl is focused on the need for doctrinal proclamation. There are theological emphases that need to be addressed and explored, and she is concerned that they are being pushed to the side in much contemporary preaching. One place where she finds this present is in narrative preaching. She’s not opposed to the use of narrative, but she’s concerned that it often fails to provide sufficient doctrinal/theological substance. Simply retelling the biblical story, even if putting it in modern life, falls short of what is needed. She writes that “doctrine gives shape, meaning, and challenge to the church and what it means to preach and live out the Christian faith, not only as individuals but also as the Christian community in its many expressions” (p. 13). As one trained to be a teacher of theology, I am heartened by this clarion call to embrace theological interpretation so as to give depth to the conversation. Of course, I also may see in what she’s saying an excuse for my own shortcomings as a story-teller. I know that some will also be less than enthralled by her call for doctrinal preaching, since there is a resistance to rigid adherence to long held doctrinal standards. But she’s not asking for this. Rather, she’s suggesting that by attending to these festivals, we are provided opportunity to erect theological signposts that can undergird the Christian story. The book begins with an introduction that lifts up the principal festivals, offering a rationale and definition of these festivals. This is followed by a chapter that explores the idea of doctrinal proclamation, which seeks to provide an answer to the question of meaning of these doctrinal emphases for today. Once these foundational chapters are read, we’re ready to explore each of the six festivals, beginning with Christmas. As she explores the festival, she starts with a brief history of the festival – how it emerged and what it stands for – the why did this emerge question. From there she moves on to the lectionary text for the festival as drawn from the Gospels. She doesn’t address other texts, except as they interact with the Gospel readings. Although brief in scope, she offers guidance as to how these texts might be utilized for doctrinal proclamation – suggesting directions that the texts can be taken. Finally, she lifts up the key doctrinal components that are suggested by the festival. I’ll pick up on her chapter on Christmas, where Hedahl starts with the history, noting its history, including the connection with existing Roman holidays, but suggesting as well other possible reasons why it was chosen. She points us to how early church leaders celebrated it and how they made use of it theologically. She also shows how the festival spread across the globe, and how it evolved as it moved across the globe, noting that in the Southern Hemisphere winter motifs so present north of the Equator are absent, but whether north or south, focus is on “worship, food, crèche scenes, and gifts” (p. 23). From the historical/cultural development, Hedahl moves to exploring the Christmas texts, noting that the choices are arranged over a two-day period, and that Matthew’s narrative is absent from the lectionary (picked up on Epiphany), with focus on Luke’s narrative, as well as John’s much more theological reflection. As Hedahl addresses this set of texts, she notes that too often the focus of preaching is on the birth, in “its beauty, glory, and delight,” while failing to address the question of “so what?” (p. 25). What is it about Christmas that matters to our lives? This requires a doctrinal answer, which both Luke and John try to offer. She notes that John’s text gives the festival a “sermonic ‘adult’ look.” There’s no birth narrative, but there is a summation of the meaning of the event – when the Word became flesh. The final section of the chapter focuses on doctrinal proclamation. She notes that the biblical texts offer a “rich tapestry of related teachings about the multiple meanings of this event” (p. 34). The focus of the festival is, of course, the incarnation. While the incarnation – the enfleshment of the Word of God – is central to the festival, there are other subsidiary doctrines that emerge from this doctrine. She notes that preachers can use this opportunity to speak of God’s nature, the two natures of Christ, kenosis (self-emptying), the doctrine of the Word, atonement, creation, sin, evil, and sacraments. All of these doctrines have at some point been addressed down through history in the context of this festival. Indeed, this particular festival will provide each of these doctrines a different emphasis in this context. The preacher might draw upon confessional materials, theological reflections, and the biblical text, seeking in a creative and imaginative way, to build a bridge between text and doctrine. The key of course to success is creativity – simply offering a doctrinal lecture will not prove effective! As with the gospel readings, Hedahl offers insights into how these doctrines might be addressed and preached in an effective manner – showing examples both ancient and modern, as to how this is done. As a preacher, I found this book to be a most helpful and encouraging resource. It offers guidance as to how one might address theological questions in creative and imaginative ways, drawing not only from personal experience or the biblical story, but also the ongoing tradition of the church. There is in her presentation an openness to doctrinal development, while being committed to a generous orthodoxy (to borrow a phrase). Being Lutheran, she is in tune with the creedal testimony, but that doesn’t mean someone like me who is part of a non-creedal tradition won’t resonate with her suggestions. Some may disagree with her on the point of whether doctrinal preaching is important or effective, but hopefully we can agree that preaching seeks to interpret the work of God in the world, and that requires theological engagement. If we seek to engage with doctrinal proclamation as Hedahl insists we must, we must try to do so in a way that is creative and engaging. Giving lectures from the pulpit, likely will lead simply to eyes of the hearts and minds of the people glazing over. The book is well-written and insightful. It is useful and practical. As a preacher, I found it a call to be attentive to the way in which I engage these great festivals of the church, which, as Hedahl points out, “trace the historical genesis and ongoing revelation of God’s reign in the world in Jesus Christ, through the power of the Holy Spirit” (p. 1). I recommend this book, not just to preachers, but to all who would seek to hear and proclaim the good news of Jesus Christ in a new way.